Fat tends to get a lot of bad press but fats are an essential part of a balanced diet for dogs. Without fats, your dog can’t survive. Too much fat and your dog will become overweight which will lead to obesity-associated problems such as diabetes and joints complications. Too little fat can affect your dog’s growth and development and cause listlessness and a dull, flaky coat. But while it’s important to include the right amount of fat in your dog’s diet, it’s also important to include the right kind of fat. So what is fat, what are the different types and what are some of the food to use to help keep your dog healthy? Acting as an energy source – fats are a great source of energy for your dog. In fact, they provide more energy than protein and carbohydrates. The fat your dog consumes through its diet, and the fats it makes from other nutrients in the body all provide energy so they can live an active, healthy life. Vitamin absorption – vitamins A, D, E and K are so-called ‘fat-soluble’ vitamins, meaning fat is needed to help your dog’s body to absorb these vitamins. Energy store – any extra calories your dog eats will be stored as fat, to be used as an energy source when they need it. Think of it as the equivalent of a back-up generator. While this energy store can be a good thing, it can also lead to a dog becoming fat. That’s because if a dog regularly consumes more calories than they use, their energy store will become bigger and bigger, meaning they’ll get fatter and fatter. Fats are also involved in the development and function of nerves, muscles and the brain, hormone production and help maintain a healthy skin and coat, and a strong immune system. While fat is one word, it’s important to remember that there are different types of fat, which are found in different types of food. Dogs don’t seem to have a list of ‘bad’ or ‘good’ fats. Instead, fats for dogs are classified as either facilitative or functional. Fats contribute to the palatability and texture of your dogs food. Adding palatability demonstrates how fats can be facilitative because no food can be nutritious if it is not eaten. This is obviously a critical function. Functional fats are usually essential fatty acids (EFAs). EFAs are fats that must be supplied in the diet because the dogs body can’t produce them. Saturated fats are normally solid at room temperature. In humans, increased levels of saturated fats are associated with high cholesterol and heart disease. These are generally considered ‘bad fats’ because consuming too much of them can lead to health problems. However, this isn’t the case for dogs. Cholesterol comes in two forms – high density lipoprotein (HDL) also known as ‘good’ cholesterol and low density lipoprotein (LDL) or ‘bad’ cholesterol. Too much saturated fat raises the levels of LDL in the blood, which can lead to heart problems in humans. However dog’s naturally have more ‘good’ cholesterol (HDL) than ‘bad’ cholesterol (LDL), meaning the fat they consume in their diet doesn’t affect their cholesterol levels. Nonetheless, dog owners should still moderate the amount of saturated fat included in their dog’s diet because too high levels can lead to obesity, diabetes and arthritis. This type of fat may also affect the progression of renal disease. Foods that are high in saturated fats and so should be included in your dog’s diet in moderation include fatty beef, lamb, pork, tallow and cheese. Unsaturated fats are found in two forms – monounsaturated and polyunsaturated – unsaturated fats provide all of the benefits of fats and far fewer of the downsides. And they are the source of the EFAs we will discuss below. Good sources of monounsaturated fats include olive oil, avocados and a variety of nuts and the oils made from them (e.g. cashews and peanuts). Foods rich in polyunsaturated fats include oily fish, flaxseed, sesame oil and sunflower oil. These are fatty acids that dogs cannot make themselves so they need to be included in their diet. All essential fatty acids are polyunsaturated. There are two main groups of EFAs: Omega-3 fats and omega-6 fats. Linoleic acid (LA), is the most important omega-6 fat for dogs, since it is used to produce other omega-6 fats. It is primarily found in poultry fat, egg yolks and plant oils such as primrose oil, olive oil and sunflower oil. There are three types of Omega-3 fatty acids. Alpha linolenic acid (ALA), primarily found in flaxseed oil. Eicosapentaenoic acid (EPA) and Docosahexaenoic acid (DHA), primarily found in oily fish such as anchovies, mackerel, herring, sardines and wild salmon. EPA and DHA are the preferred form of omega-3 fats for dogs. 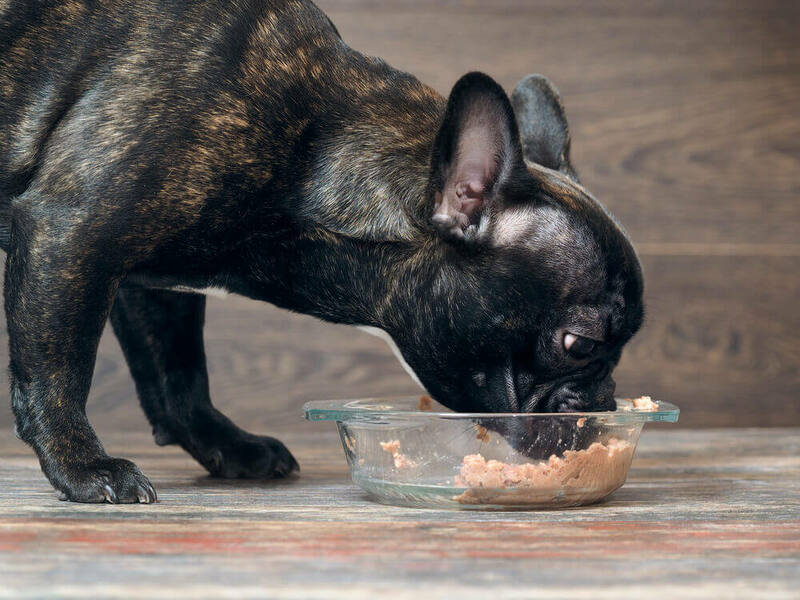 This is because most of the healthy benefits linked to omega-3 fats are linked to EPA and DHA, not the plant based ALA.
There’s no denying that importance of including fat in your dog’s diet and the role it plays in keeping your dog healthy and happy. But like most foods, when too much is consumed, the negative effects start to out-weight the positive. This means dog owners need to be careful about the amount of fat they include in their dog’s diet as well as the type and ratio of fat. Most dogs consume far too many Omega-6 fats and too few Omega-3 fats. Small changes – like not feeding fatty table scraps or that leftover sausage – can all make a big difference and help reduce the amount of ‘bad’ fats they eat. It may be beneficial to supplement with high quality fish body oil. The National Research Council has established a safe upper limit of 100 – 150 mg of EPA and DHA combined per 5 kg of body weight daily as safe. It’s also important to keep your dog active to make sure they burn off any extra fat that they don’t need.